Description / Color / Consistency: Clear, pale yellow to orange-red liquid. Aromatic Summary / Note / Strength of Aroma: A top note with a strong aroma, Eucalyptus (Dives) has a fresh, camphoraceous aroma with a faint peppermint undertone. Blends With: Basil, Cajeput, Cedarwood, Citronella, Ginger, Lavender, Lemon, Myrtle, Frankincense, Spearmint and Tea Tree. Product Abstract: Eucalyptus leaves are the favourite food of Koalas, and have been used as traditional medicine by the aboriginal peoples of Australia. It is a highly popular Essential Oil throughout the world today. Cautions: Avoid if you have high blood pressure or epilepsy. For external use only, this is considered toxic if taken internally. Dilute before use; may cause skin irritation in some individuals, so a skin test is recommended prior to use. Avoid contact with eyes. According to Essential Oil Safety by Robert Tisserand, as a Safety Precaution - Avoid all varieties of Eucalyptus - (except Eucalyptus dives) with Children under 10 yrs old due to Potential Respiratory Distress. Eucalyptus dives / SD-EFP / India / Leaf Botanical Name: Eucalyptus dives Main Constituents: Piperitone: 52.07% a-phellandrene: 20.38% Plant Part: Woods and Leaves Origin: Australia Farming Practice: Ethical Farming Practice Processing Method: Steam Distilled Description / Color / Consistency: Clear, pale yellow to orange-red liquid. Aromatic Summary / Note / Strength of Aroma: A top note with a strong aroma, Eucalyptus (Dives) has a fresh, camphoraceous aroma with a faint peppermint undertone. Blends With: Basil, Cajeput, Cedarwood, Citronella, Ginger, Lavender, Lemon, Myrtle, Frankincense, Spearmint and Tea Tree. 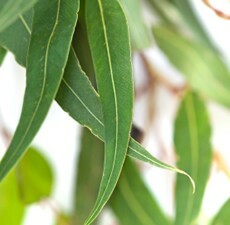 Product Abstract: Eucalyptus leaves are the favourite food of Koalas, and have been used as traditional medicine by the aboriginal peoples of Australia. It is a highly popular Essential Oil throughout the world today. Cautions: Avoid if you have high blood pressure or epilepsy. For external use only, this is considered toxic if taken internally. Dilute before use; may cause skin irritation in some individuals, so a skin test is recommended prior to use. Avoid contact with eyes. According to Essential Oil Safety by Robert Tisserand, as a Safety Precaution - Avoid all varieties of Eucalyptus - (except Eucalyptus dives) with Children under 10 yrs old due to Potential Respiratory Distress.